The recently published 2017 Scott Classic Specialized Catalogue of Stamps and Covers 1840-1940 includes many editorial enhancements and thousands of value changes. The 2017 Scott Classic Specialized Catalogue of Stamps and Covers 1840-1940 was published in early November. 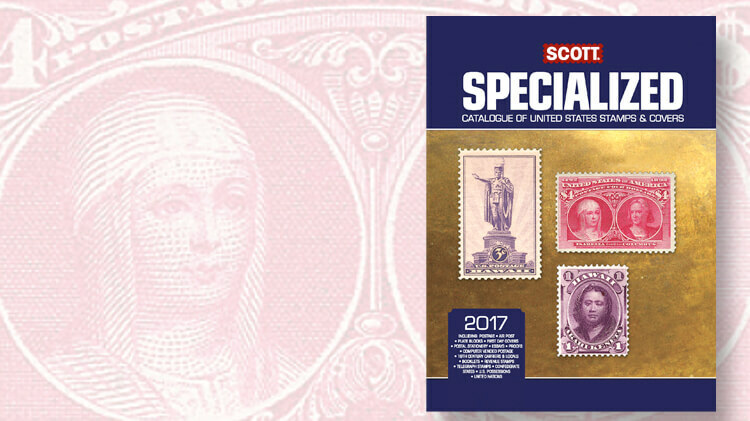 Now in its 23rd year, the Scott Classic Specialized catalog is widely recognized as the best single-volume catalog for the classic-era stamps of the world. As you scan the pages, you will find thousands of value changes; 677 new number changes and additions; and myriad editorial improvements, including many hundreds of revised and expanded listings. More than 6,600 value changes were made in the 2017 Scott Classic Specialized catalog. Add to this the almost 13,000 value changes brought over from the six volumes of the 2017 Scott Standard Postage Stamp Catalogue, and the total number of value changes soars to 19,370. Each year special editorial consultant Sergio Sismondo works tirelessly to expand the editorial content and listed values in the Scott Classic Specialized catalog, and this year was no exception. James E. Kloetzel, editor emeritus, and Bill Jones, a former Scott associate editor, also provided substantial input by updating values and making significant editorial enhancements throughout the catalog. Special thanks also goes to our many advisors who offer improvements each year to make this catalog an invaluable reference work for worldwide classic stamps. Now we turn to the content of this year’s catalog. A review of the stamps of our neighbor to the north reveals that the marketplace for Canada and Canadian Provinces has been very calm during the past year, and there are few value changes for stamps commonly seen, both unused and used. This was a good opportunity for the Scott editors to pay special attention to values of covers in early Newfoundland. With the help of expert advisors and cover census numbers, adjustments have been made for cover values from No. 1 through No. 60, as well as in air posts. Most values rise somewhat, but a few that were overvalued previously have been lowered. Newfoundland surcharged stamps also were reviewed extensively, including values and editorial treatment. There were 68 value changes in Canada semi-official air posts, all increases with some substantial increases. Among the Canada perforated Official stamps, several of the five-hole perfin (perforated initials) varieties increase in value, while many of the four-hole varieties see decreases. In all, 183 values were changed in these Official stamps. The almost 2,000 Classic-catalog-only value changes in France reflect a continued softening in values. Another 544 value changes were brought over from Vol. 2 of the 2017 Scott Standard catalog. A softening also is reflected in the almost 120 value changes that occur in Germany for the 1872 sets. Values for stamps with no gum have been added. Values are now provided for multiples for Scott 1-26, including pairs, strips of three, and strips of three or blocks of four. Values for covers and stamps with no gum have been added for the first time to Guatemala. The 81 value changes for this Central American country show significant increases overall. Hot off the press: 2017 Scott U.S. Specialized catalog now available: Almost 5,400 value changes have been made in the 2017 edition of the Scott Specialized Catalogue of United States Stamps and Covers. Almost 300 value changes were made to the stamps of Montenegro. Again, most of the changes reflect increases. Many increases are among the 235 value changes made to the listings of Serbia. The country’s first issue, the 1-para green on dark violet rose paper (Scott 1), soars from $55 to $72.50. In 1911, Turkey overprinted stamps issued during 1901-05 for Sultan Mehmed V Rashad’s visit to Macedonia. According to the editor’s note that precedes the listings, the “overprint was applied to 18 denominations in four settings with change of city name, producing individual sets for each city: ‘MONASTIR’ [Scott 165-182], ‘PRISTINA’ [165a-182a] ‘SALONIQUE’ [165b-182b] and ‘USKUB’ [165c-182c].” New values have been assigned for most of the overprints, including similar overprints on newspaper stamps (P69-P81, P69a-P81a, P69b-P81b, and P69c-P81c). Significant increases in value are seen among some of these stamps. Values for the stamps of the Virgin Islands show an overall softening of the market. A mix of increases and decreases are found among the 141 value changes in the East African islands of Zanzibar. Fans of Newfoundland are urged to examine all of the enhancements to this province’s listings and values. Clarifying notes have been added in many places, as well as single frankings on covers. Of significant importance, the 1919 manuscript “Aerial Atlantic Mail” stamp, previously footnoted, has been given deserved recognition in the 2017 Scott Classic catalog as No. C1a, with values unused, used and on cover. Here, as with many other air posts, explanatory footnotes and other enhancements round out the story of these fabled stamps. In Canada, shade varieties now are shown for the King Edward VII issue, Nos. 89-95, and other enhancements have been added to many other listings. Collectors of Switzerland will be pleased to find that many on-cover and never-hinged listings have been added, beginning with the 1907-25 set and continuing through the classic period for regular issues and back-of-the-book issues. Until 1927, Jordan’s stamps consisted of overprinted issues of Palestine and Hejaz, a region of Saudi Arabia. The basic Palestine stamps used for overprinting were inscribed “EEF” and were perforated gauge 14 or gauge 15 by 14. The overprints listed as Jordan Scott 1-63 are now expanded into separate sets of major numbers and minor numbers for stamps that are perforated gauge 15 by 14 and those that are perforated gauge 14. Where different overprint types are known, the types are now listed and illustrated. Similar to Jordan, new listings have been added for perforation varieties of classic Montenegro. The 1894-98 overprinted set (Scott 32-44) on the 1874-93 Prince Nicholas I stamps has been expanded to include new listings for stamps perforated gauge 11½, small holes, and perforated gauge 11½, large holes. Similar reorganizations are made for Scott 45-56. New listings have been added for the four types of overprints for the 1905-06 Constitution issue. The “YCTAB” is found in four settings measuring 9¾ millimeters (type I), 11¼mm (type II), 10¼mm (type III), and 8½mm (type IV). The four types are now valued and illustrated. The perforation varieties for Montenegro’s first postage due stamps (Scott J1-J8) also have been broken out into new minor listings. Among the stamps of the Federated Malay State of Pahang issued under Japanese occupation, the 1942 overprints (Nos. N1-N12) are now organized by the color of the handstamp (black, red, brown, or violet). The same is true for the stamps of Perak issued under Japanese occupation (Nos. N1-N16). Several new minor listings also were added to Serbia for perforation and paper varieties. The 23rd edition of the Scott Classic Specialized catalog brings to a close the 2017 Scott catalog season. As always, we encourage catalog users to pay special attention to the Classic Specialized Additions, Deletions & Number Changes. 2017 Scott U.S. Specialized catalog: Which section is getting a major makeover?